1. Jennifer and Sherry give advice on how to get involved working at a fashion magazine. For all those aspiring fashion mag editors out there. 2. NYTimes article "When 'best' isn't good enough." A discussion of the valediction used at the end of an email. I admit I tend to use 'best' as my fall back or xoxo, besos/beijos (i.e., kisses) with certain friend/family. In my youth I tried out various droll, dull, and atrocious closes such as: "peace," "peace out," "hit me back" (shudder), "sincerely," and the antiquated "yours truly." I didn't realize people felt such ownership of their closings until reading this article. What do y'all close your emails with? 3. When I was sick, Lanvin H&M put out a trippy video displaying the collaborative collection (due in stores Nov 20!!). I really like the yellow one-shoulder dress (and I love that they show it on an older woman as well as younger woman. (As an aside, I also appreciated that they showed one model who wasn't a waif - although most of them were). Watching the video, I kept thinking, "That is one stylin' grandma!"). I also really like the ruffle-y skirt (which is actually in my price range-ish). So I played around with a couple polyvore sets to show how I might style it. Also, I found this video from the NY Times with Alber Elbaz interesting. I like seeing images of Jeanne Lanvin herself and hearing a little about the history of the brand. 5. Why Women apologize more than men. These researchers find that women do indeed apologize more than their male counterparts. Their data suggest that this gender difference may stem from differences in construal of one's behavior. Men may not perceive their actions as offensive as often as women do. The scientists elaborate on their findings and offer some relationship advice. OMG, It's like a data driven Cosmo article or Dear Abby column. If you don't want to watch the vid, here's a news article on the research or see the journal article abstract here. 6. Love as my painkiller. Scientists find that intense love activates the same brain areas as those areas affected by pain relief medication. See the full journal article here or the press release/synopsis of the findings here. 7. 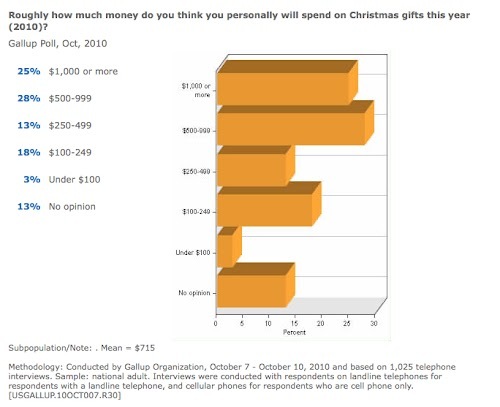 How much $ are people planning on spending on holiday gifts this year? The survey results reported here were obtained from searches of the iPOLL Databank and other resources provided by the Roper Center for Public Opinion Research, University of Connecticut. Wow, for some reason I thought the mean would be lower than this given the current recession. $715 feels a bit high, but after thinking about the gifts I'm planning to buy for various people, I guess I could see that. This reminds me: In doing your holiday shopping this year, you might think more about what you're spending the money on. Research suggests that experiences may make people happier than consumer goods. Help your loved ones create memories, not clutter :) Or, at least I need to try to remember that. The Lanvin for H&M vid is awesome. I too love how they used an older woman and a large size women. Check the part where the crowd of younger women and the older lady are all wearing the Gold one shoulder dress. The older counterpart is the only one sporting Black tights. Your polyvores for the Ruffle Skirt are chic and daring. Love this post, Lori! I was especially interested in the "When Best Isn't Good Enough" article. I too tend to resort to some version of "Best" when signing work emails. I haven't yet sent an accidental "love ya" email to any of my colleagues, though I do tend to sign "best" on emails to the BF that I write from work -- much to his chagrin. When I arrived at college and received mass emails from the president (an Augustinian priest) I was puzzled as to why he was informally signing his messages "Peace." Then, I realized that he meant "the peace of the Lord be with you"...and not "peace out." It was quite an epiphany for someone who was public-school educated for 13 years! I didn't really consider my style that feminine until I saw your set. I absolutely love that style. It's feminine, but not immature and girly, if you get what I mean. Anyways, new follower! I love your effortless style and your dog! hehehe great post Lori - an no outfit picture too! Regarding closing emails, i sign with "cheers" or "cheerio" to my friends. With work colleagues, i remain professional and use the standard "regards". As for holiday gift spending...well.. does that include presents to yourself?? if so, that'll be about right! I am loving the uptown chic look! Very timeless. This is such an interesting post. I look up all the email i send and get, the most common ending is Thanks among co-workers and cheers among friends. I like both of the look you created, but I am afraid I can never use any of the two.... High pointing heels are my enemy. I pretty much just end emails with my name, no closing. The exception is emails to my grandparents, which use "love", and certain ones for work and school, which use "thank you". Excellent post and good points! Whoa. This post was really interesting! Thanks for giving little snippets too!